Port Townsend, today. 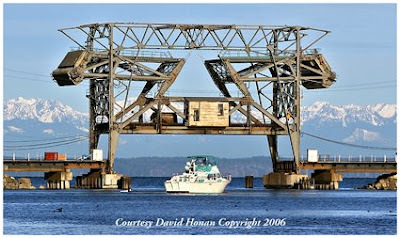 Steilacoom Washington is the “home” of one of the more unusual railroad bridges in the United States. I found quite a challenge to trace the history of this remarkable structure, a favorite shooting location for many Northwest rail fans. 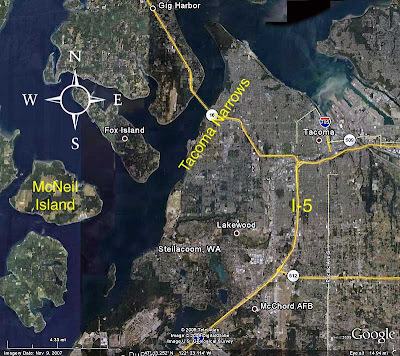 Steilacoom and the surrounding area were first settled in 1850. 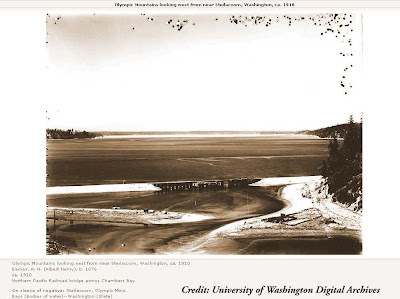 A major factor for development was a small-protected estuary, fed by a lake and connecting creek, this photo dated 1910, shows a rather quiet backwater on Puget Sound. The creek endured a series of name changes, more often than not dictated by who the major developer was on shore. Originally named Steilacoom Creek in recognition of a small encampment of Scht’ileq’wem natives, it later became known as Heath Creek, Byrd Creek, and finally Chamber's Creek. 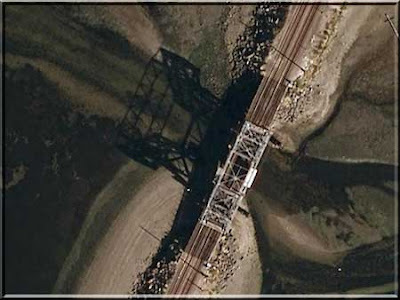 Bridge 14 casts its unique shadow on the beach. The town site became known as Steilacoom, and in 1854, became the first incorporated town in Washington Territory, only four short years after Captain Lafayette Balch first landed and set up shop. Later, with the approaching Northern Pacific Railway, the town’s movers and shakers tossed and turned at night dreaming of becoming the Western Terminus of the Northern Pacific. Seeking a water level route south of Tacoma along Puget Sound, the Northern Pacific bought up rights through Steilacoom on its way south to Olympia and thence to Kalama in 1910. 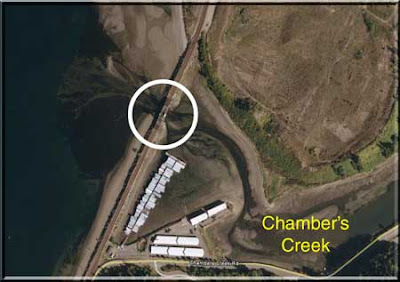 To run steel along the Puget Sound, a decision had to be made to place a fixed or movable span structure across Chamber's Creek. While the latest US Coast Guard Inventory of Navigable Waterways (2008) now excludes Chamber's Creek, as usual, more than one branch of the federal government has a seat at the tea party. The United States Corps of Army Engineers databases were searched for their classification of that sleepy waterway. Under that definition, one has to wonder that if a river dries up, is it still considered a navigable waterway because of it’s historic past? But let us not struggle with the logic of government logic. 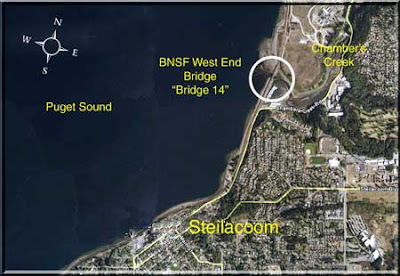 To comply with the stipulation of Paragraph 329.4, providing for the passage of vessels, the Northern Pacific Railway contracted with Strauss Bascule Bridge Company for a span over “Steilacoom Creek.” (Lets settle on a name, guys!) 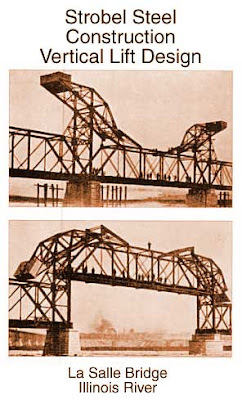 Joseph B. Strauss, America’s premier bridge designer (the Golden Gate) proposed a radical departure from the traditional vertical lift span, to be known as the Strauss Vertical Lift Bridge. Construction took place between 1913 and 1914. 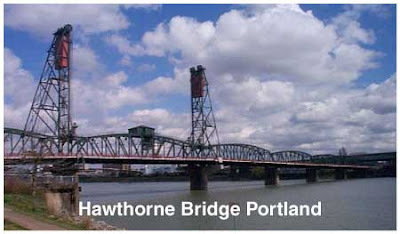 What sets this bridge aside from all other vertical lift bridges is the way in which the movable span is lifted. 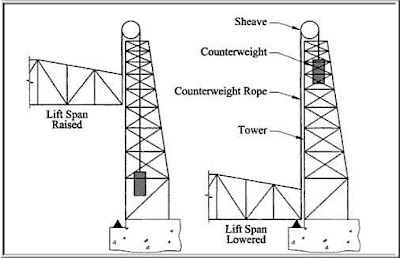 Traditional vertical lift bridges rely on cables running over massive sheaves atop spidery towers, connected to the movable span and counterweights to raise and lower the span. Cables are subject to wear and tear, constant inspection and maintenance. Furthermore, the steel cables, under load, will continue to stretch, requiring adjustments that interrupt traffic flow. 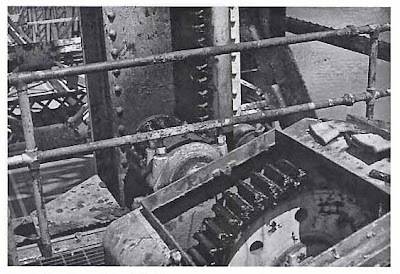 Mr. Strauss replaced the troublesome cables with a direct drive gear and pinion arrangement, whereupon the lift was accomplished with counterweights and gears. So, that’s what gives “Bridge 14” it’s unusual look and interesting movement as the 97’ center span is raised and lowered. 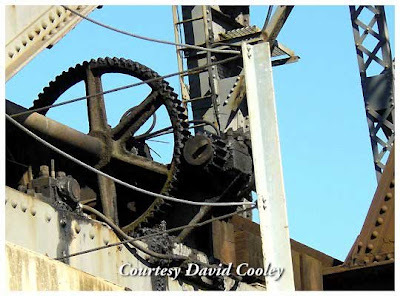 The employment of parallelogram links replaces the need for steel cables. 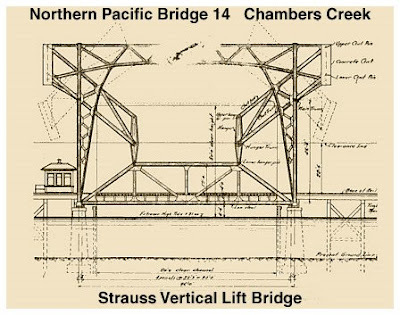 The Strauss Bascule Bridge Company, founded by Joseph B. Strauss in 1904, had about a dozen bridges of this design on paper for installation around the country, but they were never constructed. Only three bridges of this design were built. 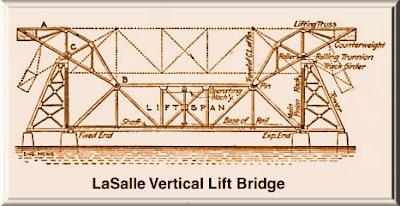 Another première bridge builder, Charles Louis Strobel founder of Strobel Steel Construction built a similar cable-less vertical lift bridge over the Illinois River at LaSalle, Illinois. Study the two designs - there are differences in approach. But a phone call today to the Illinois Department of Transportation confirms it is long gone. The third bridge of this type built was built over the Ohio River in Kentucky. It too, is gone. I hope you have a new appreciation for a very unique and apparently one of a kind bridge, one that perhaps we've taken for granted. It is a living monument to both Joseph B. Strauss and the Northern Pacific. Railway. 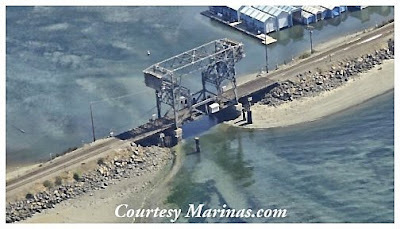 I think the structure would be a great project for Northern Pacific fans to see “Bridge 14” registered as a National Historic Landmark, yes? See also: Bridge 14 Revisited. And Perry Brake, at the Steilacoom Historical Museum Association as well as Tom Domagalski at the Illinois Department of Bridges. Fascinating. What a beautiful construction. Thank you. To think of the times I rode the trains between Seattle and Portland and never noticed this astounding bridge! Ah, well... those pool trains weren't equipped with domes and it's hard to tell what it is you're going over from just a side view. I saw this for the first time in 2012 and i could see it was unique i turned to the internet hoping to find some scraps of information and was thrilled to instead find your excellent article! Thanks for the time.